Religious parties would receive 32 seats, more than 25% of the total. If the latest poll is a correct indication, the next Knesset will be more religious than any of the previous ones, with over 25% of the MKs belonging to religious parties. Kadima and Ehud Barak's Independence party both do not make it past the threshold of entry into the Knesset, according to the poll, which was conducted over the internet and is thus considered to be less reliable than other polls. 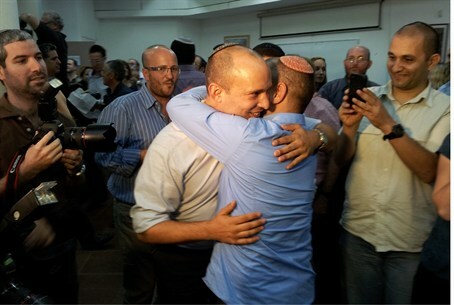 The poll was conducted 12 hours after Naftali Bennett was elected to head the Jewish Home party, and MK Zevulun Orlev announced he was leaving parliamentary politics. The Jewish Home/National Union's showing is a particularly strong one – reflecting, perhaps, that Bennett is indeed a harbinger of a new era for the religious Zionist camp. MK Amsallem's Am Shalem receives 4 MKs, in what is also an impressive entry. According to political blogger Tal Shneider, the party's voters are believed to be previous supporters of Kadima, Likud and Shas.